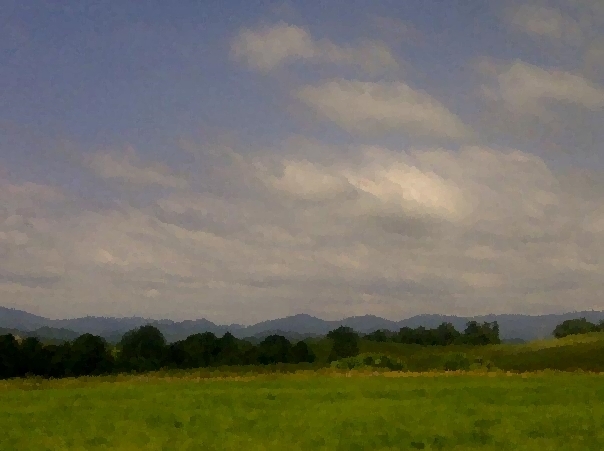 The Blue Ridge Mountains of North Carolina in Summer. The South Eastern Region of the United States inspires artisans with its wildness and beauty. The unique geology consists of coastal, Piedmont and mountain ranges. The culture that is found has evolved from the first to settle the land. Mountain Blue Grass musicians with their roots in the Scotish and Irish heritage they brought with them to this “New Land”. The Botanical roots of the English countryside with the transplanted flowers and trees like the Wisteria. And, the rugged beauty of the landscape which is uniquely American. I find all of these qualities to be inspirational in my jewelry designs, artwork and photography. Growing up in the southwest, Oklahoma, I do miss the beauty of the rolling prairies and expansive skyline with its deeps purple and Crimson hues. However, not being a native to this region adjusted to its nuances I think that my eyes are more keenly attuned to the beauty in what most Carolinians take for granted in their everyday lives. My hope is that my work captures and re-inspires them to see with “New Eyes” the things to which they have become accustomed.